The term ‘foreign body’, to mean a substance of external origin present within the human body, entered medical language in the mid 1700s. From that time, collections of ‘foreign bodies’ have fascinated audiences - how and why do non-human items end up inside the human body? Where do we draw the line between human and animal, living being and inorganic ‘thing’, self and other? 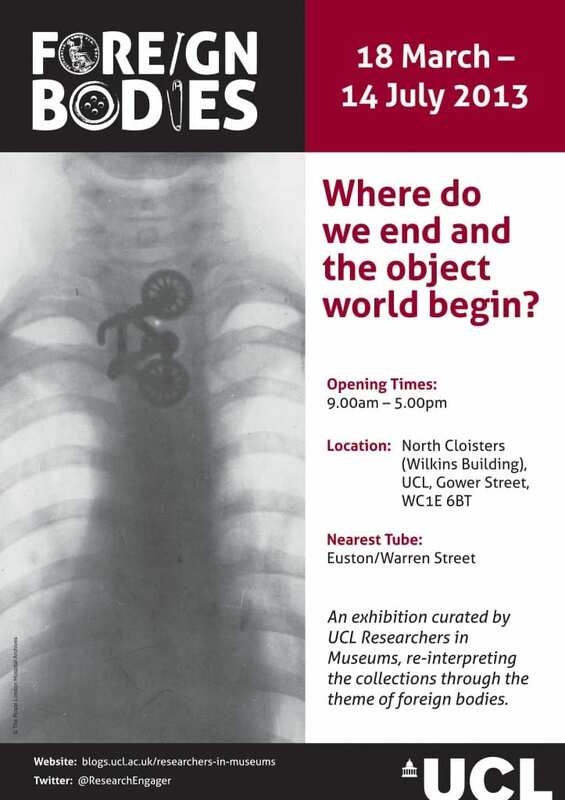 UCL Exhibition poster, 18th March -14th July 2013. Through seven very different research projects, this exhibition addresses the idea of what is alien to us – biologically, psychologically, socially and politically – and how this concept has shifted across history, culture and even species boundaries. Curated by Sarah Chaney, Gemma Angel, Suzanne Harvey, Alicia Thornton, Lisa Plotkin, Felicity Winkley & Tzui-Liao. Playbill advertising ‘Prince Giolo’ in London, 1692. Etching by John Savage. The concept of a ‘foreign body’ resonates with my own research on the history European tattooing in two quite different ways: From as early as the 16th century right up until the late 19th century, the body of the ‘exotic’ tattooed foreigner was put on display in Royal courts, at anthropological exhibits, World fairs and sideshows across Europe. The permanently marked body of the imported ‘savage’ was a source of fascination amongst European scientists, doctors and anthropologists, many of whom associated indigenous European tattooing practices with primitivism, degeneracy and even criminality. Syphilis infection in a tattoo. Illustration from Notes of Cases on an Outbreak of Syphilis following on Tattooing, in the British Medical Journal, May 4th, 1889. My approach to the exhibition theme thus explores the ways in which the body modification practices of the foreign other have been read and interpreted by European intellectuals in the construction of discourses of abnormality. Whilst some 19th century scholars sought to pathologise tattooing as a sign of atavism or latent criminality, others were concerned with the potential health risks associated with tattooing. The process of tattooing itself involves the permanent injection of a foreign body into the skin: ink. Without proper antisepsis, tattooing could also unintentionally introduce other foreign bodies, such as bacterial agents and harmful viral strains to the body. The tattooed body has been an object of spectacle and a source of fascination in Europe for at least 4 hundred years. 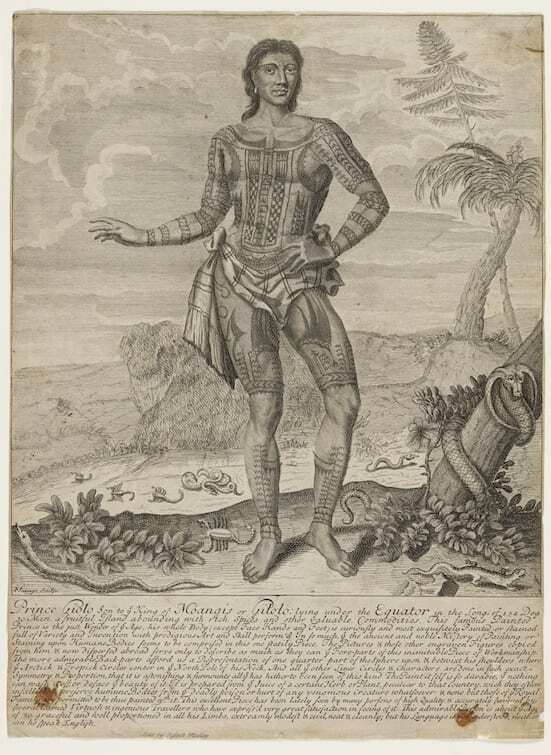 Tattooed natives captured by European explorers were transported to Europe and put on display as curiosities or ‘sights’ from as early as the middle of the 16th century. In 1566, a tattooed Inuit woman and her child were kidnapped by French sailors and put on display in a tavern in Antwerp, The Netherlands. 10 years later, the sometime pirate and seaman Martin Frobisher returned to England from his voyage to Baffin Island in northeastern Canada with a native man whom he had abducted.